ARE PESTS, TERMITES OR RODENTS DAMAGING YOUR HOME OR BUSINESS? When you’re buying a home or business, you get insurance and you check the building for problems. A General Pest Inspection is both an initial check and a low fee regular maintenance item that will save you thousands in the long run. Consider the risk of cockroaches, mice, spiders, snakes, possums, rats, fleas and ants .... EVERY home or business gets some kind of pest. With young children or a business, the need for peace of mind and protection against bites, noise and disease is one reason people use us. The second reason is large damage bills. Ten years ago the CSIRO showed 1 in 4 homes were attacked by termites ... now that stat is 1 in 3. 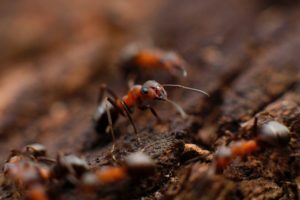 With the risk of repairing a termite attack between $900 and $180,000 (and that’s just in my experience), a twice-yearly inspection and treatment regime is both cost effective and worthwhile. These destructive critters may have evolved over millions of years, but they can’t match our technology. Camera probes, moisture detection equipment, sonic testing devices are our go-to for inspections. When it comes to treatment, we diagnose, mix and treat for EXACTLY what you need. That way we can guarantee our services every time. As Gold Coast and Brisbane based Pest Controllers, we know local critters and how to handle them. We service the south of Brisbane, Tweed Heads, Biggera Waters, Runaway Bay and the length of the Gold Coast. An age of experience working in local conditions means we know how to operate efficiently in this environment, this ensures cost-effective services.